Can Bohemian Rhapsody Defy Critics and Earn a Best Picture Nomination? Bohemian Rhapsody remains one of the strangest stories of this year’s Oscar season. Of all of the films playing, the one people tell me more than any other film that they want to see or that they saw and loved, it’s this one. It’s true that there were objections — many many objections — with the film’s treatment of Mercury’s sexuality – and critics did not praise the film, to say the least. But audiences are going nuts for it. Not only did it dominate the box office but those who have seen it rate it highly. While it’s true that a film like Venom, also panned by the critics, has that same disconnect — low rating from critics, high rating from audiences. It’s an interesting thing to look at to test whether the critics represent how audiences are feeling about a movie. Sure, that’s always been true. Critics, by and large, will like films audiences don’t and vice versa. 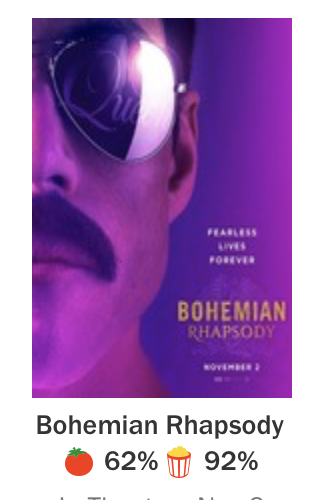 Why it’s weird with Bohemian Rhapsody is that the love for Queen, for Rami Malek’s performance, and for the film overall is overriding everything else. I’m not sure I’ve ever seen that happen before in quite the same way. This attitude has been growing now for a few years but has reached the point where a movie really isn’t just a movie. It has to be symbolic of a political point of view, or at the very least not conflict with what’s seen as a proper point of view. It all falls under the idea that “representation matters” – which of course it does. But so does art? So does freedom of expression? If the left falls into the same trap that the right has when it comes to movies – are all of our films now going to adhere strictly to our leftist ideals? Is that the right way forward? I’m not here to tell anyone whether or not they should pay to see Bohemian Rhapsody. I’m just telling you that out there in the world, outside the bubble of the internet? This is one of the movies that is turning people on, making them want to go to the movies – that kind of magic doesn’t come along very often. Young folks would call it problematic, both for the person who originally directed it (Bryan Singer) and for what they believe is erasing the nature of Freddy Mercury’s sexual identity. I also think that no one cares what I think. I’ve long since been written off as old and out of touch (hey, that’s better than racist, right?) but I do know that art matters. Truth matters. These things can’t be structured around a specific political ideology and survive. Kiki Layne Discusses Her Acting Debut In If Beale Street Could Talk. "We recognized that in order for this to succeed, some of our walls had to come down."